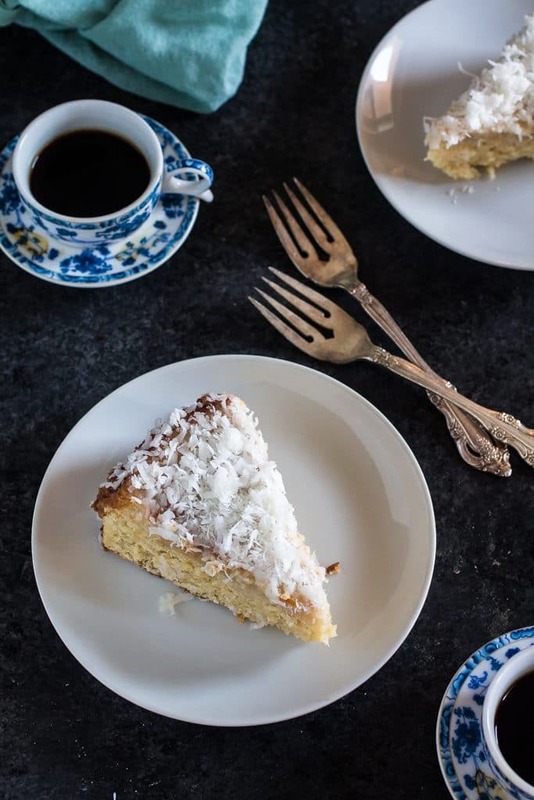 This super moist coconut cake is the perfect excuse to linger around the dinner table a little longer, enjoying some coffee and the company of friends and family. We Brazilians usually don’t need any excuse to stay at the table for hours. After a good meal, there’s always dessert, and coffee, and digestif wines, and talking, laughing and sharing precious moments with our loved ones. We don’t have a word for it in Portuguese, but in Spanish that is called “sobremesa“. The dictionary describes it as “sitting around the table after lunch or dinner”, but it is so much more than that. It is a lifestyle! I don’t believe there is a word for it in English, mostly because Americans are not accustomed to that habit. No wonder, as Americans are always in a hurry. It’s the whole “time is money” mentality that makes them eat their lunches at their desks, sucked into their monitors, so as to not waste a single minute. When he told me that, I was flabbergasted! ? In Brazil we take 2 hour lunch breaks and we savor every minute of it! Don’t even try to schedule a meeting between 12:30 to 2:30pm, because people really respect the social experience of lunch and nobody will be at the office. And when you go out for lunch or dinner, the waiter only brings your check if you ask for it! I totally agree with her. America is definitely missing out on the habit of using food as an excuse to spend time together! And before you say that doing sobremesa is the reason I’m on the chubby side, let me say you don’t really have to have anything indulgent. A nice cup of coffee will do! 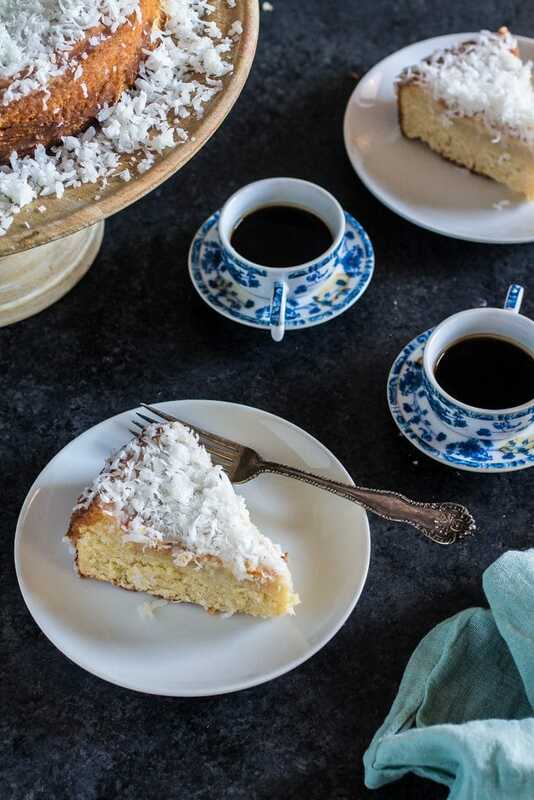 I usually choose to have amazing Brazilian Moist Coconut Cake with my coffee! Oops! ??? These days, I don’t do sobremesa too much, since my family is far away in Brazil and it’s usually me and my husband. But I had a pretty rough week. Last week ended up with lots of exciting possibilities, but they all fell through this week and I was feeling pretty lousy. So I baked a delicious cake that tastes like my childhood. And me and Tim enjoyed it with some cafezinhos – the Brazilian version of the hispanic “cafecito” – while talking about our weeks and just enjoying each other. My coffee of choice? 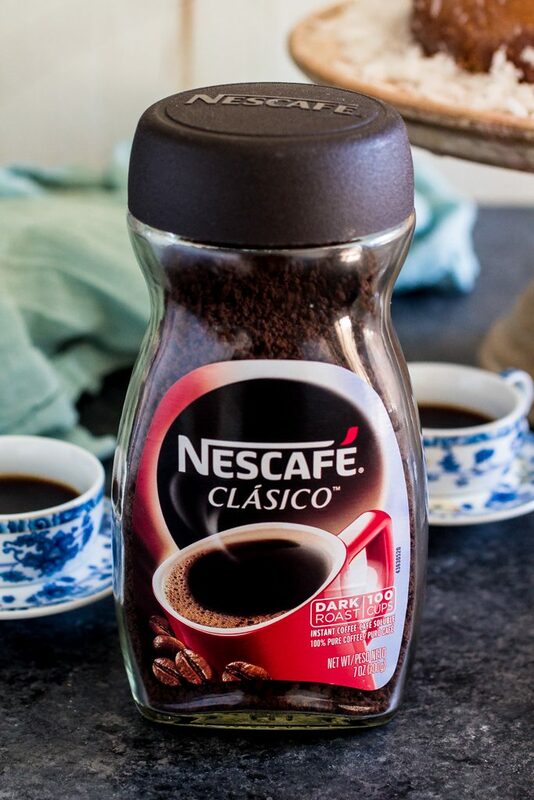 NESCAFÉ CLÁSICO! The leading coffee for Latinos in the United States. It is 100% pure coffee, made from a blend of selected coffee beans, carefully roasted to capture its full flavor and aroma. Not to mention it is very convenient, as I don’t have to deal with a french press/espresso maker/coffee filter/”enter a complicated form of making coffee here”. And the best part? It goes amazing with a slice of cake! 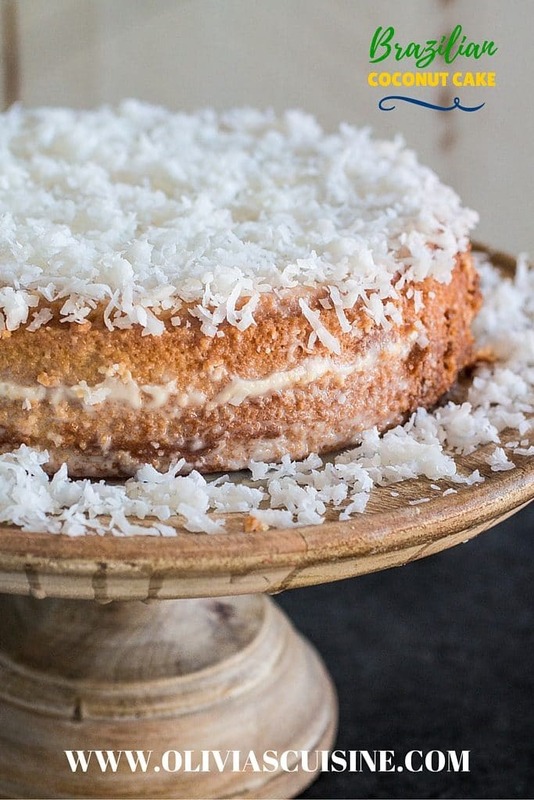 Especially with this Brazilian Moist Coconut Cake. ? The recipe is really simple and easy to follow. It’s a basic sponge cake that is moistened with a “sauce” made of coconut milk and sweet condensed milk. I guess you could call it the Brazilian version of a Tres Leches Cake. The cake is then served cold! It is a staple at children’s birthday parties in Brazil! At those parties, the moist coconut cake is usually served already sliced, wrapped in aluminium foil! I guess that’s convenient, especially when children are involved, but I always found it to be extremely tacky! So I’m serving mine on a cake stand. Because presentation is everything, don’t you agree? And, I have a surprise for you. I MADE A VIDEO! You guys… seriously… my first video ever! Are you excited? Please don’t! I still have a lot to improve, but I had fun doing it. So, please don’t judge! I hope you guys enjoyed it! And I hope you give the sobremesa lifestyle a try. Even if it means bringing coffee to the table after dinner! Pre heat oven to 350F degrees. Grease 1 (9-inch) round cake pans, then line it with parchment paper. Grease again and dust lightly with flour. Combine the butter, sugar and egg yolks in a large bowl. Using an electric hand mixer, beat on medium-high speed for 3 to 5 minutes, until light yellow and fluffy. Add the vanilla and mix well. The mixture might look curdled. Don't worry, that's normal! In a separate bowl, sift together the flour, baking powder and salt. With the mixer on low speed, alternate between adding the dry ingredients and the wet ingredients (milk and coconut milk), beginning and ending with the dry ingredients. Mix until just combined. Reserve. In a separate bowl, beat the egg whites on high speed until stiff peaks form. Gently fold the egg whites into the batter until evenly blended. Pour the batter into the prepared cake pan and bake in the center of the oven for 45 to 60 minutes, until the top is browned and a cake tester comes out clean. While the cake is baking, make the "sauce" by whisking together the coconut milk and the sweet condensed milk. Mix until well combined. Reserve. When the cake is baked, but still warm, remove from pan and cut it in half and moisten the bottom part with half of the "sauce". Place the top part on top of that and, using a toothpick, poke holes all over its surface. Then, pour the remaining sauce until the cake absorbs everything. Sprinkle with the shredded coconut and refrigerate until cold, for at least 4 hours. Recipe adapted for the "O grande livro da Palmirinha" cookbook (in Portuguese). 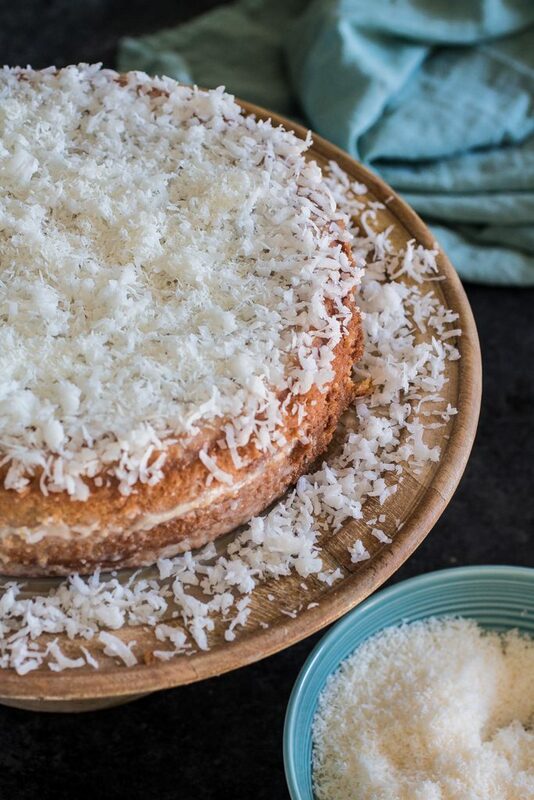 coconut cake is one of my all time favorites — and your recipe is really intriguing — love that sauce! I have a small pack of nescafe classico left here. I want to just make this cake to have a cup of coffee. This looks soooo good. And moist. I grew up spending hours around the table after meals and chatting, sipping more coffee or wine (or juice as a kid), and continue to do nights like this now that I have kids of my own. Both my husband and I cherish quiet nights together chatting and catching up. Your cake sounds delicious by the way and I think it’s definitely something I should make for our next “night around the table”! This cake does pair perfectly with coffee!! Love your cake recipe and the video! I’m a Brazilian blogger too! Vamos connector-nos! Abracos! This cake looks awesome! I absolutely love coconut so this recipe is right up my alley. Wanting a piece right about now ;) Delish! Love coconut cake! This one looks great! This coconut cake is one of my favorites! Awesome coconut cake.. loved reading the complete post.. Recipe looks amazing. Wondering if it is sweetened or unsweetened coconut milk? Hi! This looks fabulous! I’m going to make it for our international food tasting night at my children’s school. Do you top the cake off with sweetened or unsweetened coconut? Thanks for stopping by! :) I top mine with unsweetened coconut, because the cake is already pretty sweet thanks to the sweet condensed milk. However, it is up to taste, so if you like sweetened coconut, go for it! Also, I love that your children’s school has an international food tasting night. That sounds like a lot of fun! Can you bake this a day ahead of time and freeze? Making it for my niece’s bridal shower. She’s from Brazil, living now in the US; we wanted to bring her a little taste of home for her shower. This is a great cake. Can you clarify: Grease 1 or 2 (you have panS with an S) and then you say to cut it in half and you haven’t done that in your video. I found it too 80 minutes to cook and the coconut milk and sweetened condensed milk mixture was very runny! I’m having it tomorrow night so I’ll let you know how it tastes. Making your cake today for my wife. She is Brazilian from Vitoria. I am hoping this brings back memories of Brazil, it looks delicious and I know it’s something she has been desiring.